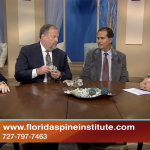 This week, the Florida Spine Institute’s Dr. Ashraf Hanna and Dr. Scott Webb were on a CBS News segment to discuss artificial disc replacement surgery and the latest advances in spine surgery. The CBS segment featured the new cutting-edge procedure, Artificial Disc Replacement, which is changing lives and revolutionizing treatment of chronic back and neck pain. The Florida Spine Institute has been the leader and most trusted medical facility in the Tampa Bay area for over 25 years. We are proud to offer the latest advancements in treating spine pain, joint pain and spinal surgery. To get more information about this procedure, click our link below.